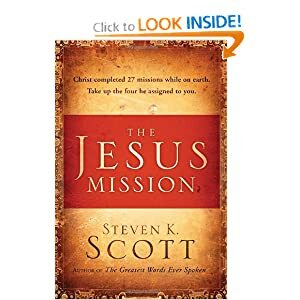 I recently received "The Jesus Mission" by Steven K. Scott. I wasn't quite sure what to necessarily expect from this book, but the cover led me to read this book, as it stated "Christ completed 27 missions while on earth. Take up the 4 He assigned to you." To be honest, I'm not really for mathmatical equations when it comes to the lessons God teaches us through scripture, and I feel as if this book in particular had 5 points here, 4 points there, and so forth. I would have much rather been encouraged by the number of things I felt drawn out of the text, rather than they be pointed out to me every turn of the page. The book is written into 3 different sections: "Intimacy with God, the Way He Wants It, The Missions Christ has Given to You, and What You Never Knew About Jesus That Will Change Your Life." If you are picking up this book and wanting to know your mission from the beginning, you might be a little disappointed to discover that it is not revealed until much later in the book. Throughout the book, I felt as if the author really did not have a specific purpose, and therefore his voice gets lost throughout the text. This isn't my favorite book on the subject of missions and purpose in life, and I can think of many other books I would recommend before this one.